Event Description Bradford Court Assisted Living is hosting the Nixa Chamber Learning Cafe for the month of February at Bradford Court Assisted Living. 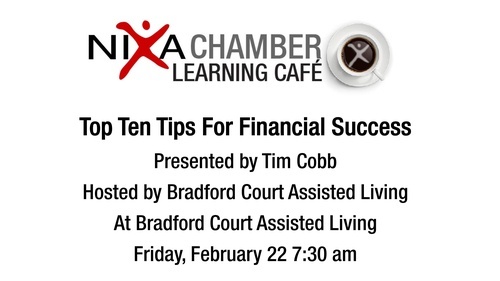 Tim Cobb will be presenting Top Ten Tips For Financial Sucess. Start your Friday morning with coffee, networking, and some great finance tips. Drop by for a few minutes or stay the entire time! Nixa Chamber Learning Cafe is held on the 4th Friday of every month. If you would like to host an event at your business, please contact The Chamber Office.